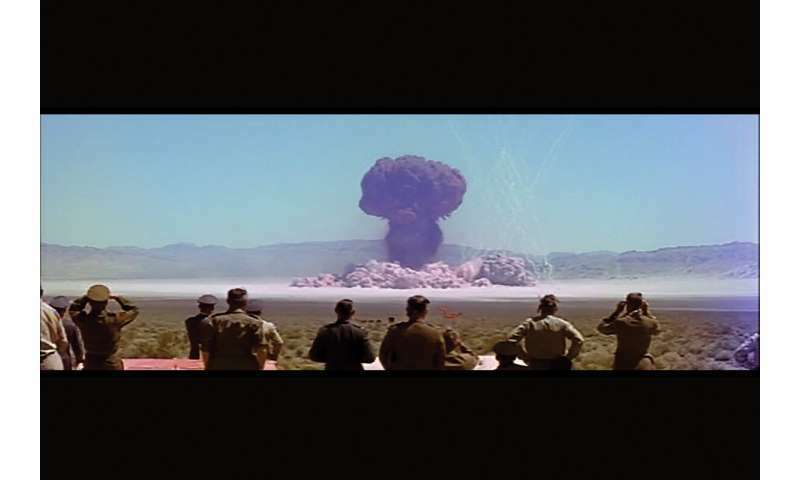 Observers look on during a nuclear test in the Nevada desert in the early 1950s, one of many filmed by a secret Hollywood studio called Lookout Mountain Laboratory. Its story is chronicled by University of Illinois professors Kevin Hamilton and Ned O'Gorman through a new book and website. Credit: Image from CinemaScope footage from 1955, restored and reconstructed by Peter Kuran. Photo courtesy the Atomic Filmmakers, Santa Clarita, California. Our images of mushroom clouds came from its cameras. So did many shots of missile tests, space missions and the Korean and Vietnam wars. Yet the story of Lookout Mountain Laboratory was largely unknown—until two University of Illinois professors spent 10 years piecing it together for a new book and website. The studio's story had not been fully told because it was run largely in secret, as a unit of the U.S. Air Force. Its films and photos were rarely credited and many are lost or were destroyed. No systematic effort was made to preserve its 22-year history, from 1947-69. Lookout Mountain, however, played a central role in the U.S. government's efforts to control—often unsuccessfully—the science and story around nuclear weapons in their early years, say co-authors Kevin Hamilton and Ned O'Gorman. Their book "Lookout America! 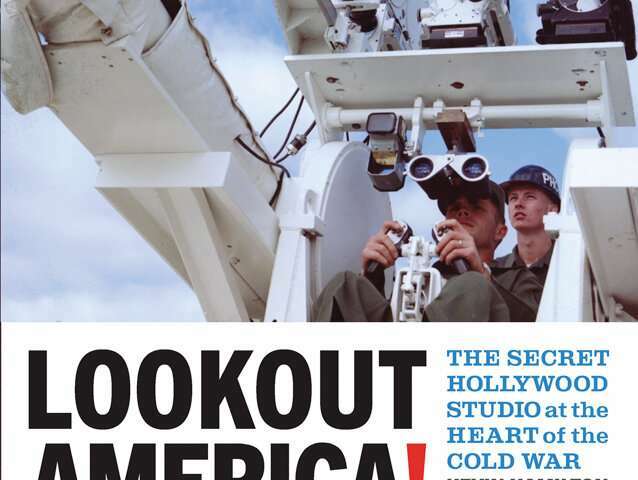 : The Secret Hollywood Studio at the Heart of the Cold War" explores the studio's history and significance by way of very different fields of study. Hamilton, a professor of art and design, studies public art and new media. O'Gorman, a professor of communication, specializes in the history and rhetoric of the Cold War. In their research, the authors were struck by Lookout Mountain's sheer productivity. In just two decades, its photographers shot film footage that would require 10 years to view, as well as millions of still photos. Its globe-spanning operation handled everything from scripts to shooting to storage. "More than any other site on earth, Lookout Mountain visually chronicled the activities of the U.S. Cold War state," the authors wrote. Nearly all the Cold War's iconic images would not exist without it. Its film clips and photos have appeared in movies such as "Dr. Strangelove," in television newscasts, in documentaries such as Ken Burns' recent series on the Vietnam War. For a number of years, it shot every Bob Hope Christmas special staged at overseas U.S. military bases. An extensive collection of the studio's work—over 100 films or film clips, along with some photos and documents—can be found on the book's companion website.The authors' research into the studio began when O'Gorman found a reference to a film President Eisenhower had viewed about a thermonuclear test named Operation Ivy. He found a short version online and showed it to Hamilton. They noted it was made by Lookout Mountain Laboratory. "We had never heard of it, didn't know what is was and so we just started digging," O'Gorman said. The resulting project sometimes took on the feel of detective work, he said. "We were just piecing together a bunch of obscure clues and starting to make connections." One thing that piqued their mutual interest early on was in viewing the Operation Ivy film and noting the excessive screen time devoted to operators in front of consoles. In a film about a historic test, they wondered, why that and not more "money shots" of the mushroom clouds and the drama? They eventually concluded that men in front of consoles projected an image of control. "The government began to realize that the images of the tests themselves had the capacity to create unmanageable fear and unmanageable effects," said Hamilton, now also the dean of the College of Fine and Applied Arts. "Men in front of consoles was a way of arguing that America has the proper apparatus and the proper bodies and the proper authority to keep that seemingly unmanageable and fearsome technology under control." Lookout Mountain "had first dibs on telling the story, and story is a way of making order out of disorder," O'Gorman said. "They were central in controlling narratives about the bomb and they were controlling those narratives primarily for audiences who had security clearances—mostly high-level government officials. The public would see only part of the studio's work, often years later. The studio and its people also were "very, very good at what they did," O'Gorman said. "They were committed to their craft." Their engineers and technicians "problem-solved in really amazing ways," designing many new tools and techniques, Hamilton said. "They stretched through crazy time and space constraints to get things done." One example is on the book's cover: an anti-aircraft gun mount adapted for tracking missile launches with movie cameras. In telling the story of bomb tests, the studio's films often presented nuclear weapons with "a certain kind of inevitability ... making them seem almost like a force of nature," Hamilton said. At times the films seemed to suggest the government had no connection to the weapons it was actively developing, he said. The films also often downplayed how the tests affected people, O'Gorman said, whether it was Pacific islanders required to move to new islands or people in the way of nuclear fallout. Despite all that, however, control was often lacking. "Each time they did one of these tests, they never really knew what they were going to get, at least early on," O'Gorman said. One major test, Operation Castle, produced a yield that far exceeded predictions, infamously irradiating a population of Marshall Islanders, a group of Japanese fishermen and millions of square miles of the Pacific Ocean. "And for all their efforts to control the narrative, most of it didn't work," O'Gorman said. In fact, it's a central theme of the book. "It is about the foolishness of kings, so to speak, the belief that they can not only create these things but control them, both technically and narratively. And I think our story shows that they could not."